Wash and soak the rice for about half an hour. Boil with all whole spices and salt till about 70% done. Add ghee and lemon juice at the end of boiling time. Drain well and spread out on a flat tray to cool and dry. Soak saffron in warm milk and keep aside. Dry roast poppy seeds on low flame till light golden and then with a little water grind into a paste. Whisk yogurt well with red chili powder, kashmiri red chili powder and coriander powder. Take 2 tbsp oil in a heavy bottom pan and on low flame fry onions till golden brown. Drain and keep aside. In the same pan that you fried the onions in, heat the remaining 2 tbsp oil and add bayleaf. Add in ginger garlic paste and fry for about 30 seconds on low heat. Pour in the whisked yogurt and cook for about 10 minutes on low heat. When the oil starts to separate, add half of the onions fried earlier and poppy seed paste. Stir well and let it cook for a further 5-6 minutes. Keep on stirring to ensure that the paste doesn’t stick to the bottom of pan. If needed, sprinkle with a little water. Add in the slit green chilies, salt, garam masala powder, green cardamom powder, eggs and gently stir to ensure eggs don’t break. Another 2-3 minutes and switch off the gas. Mix in the coriander and mint leaves. Take a heavy bottom pan and smear the base with ghee . 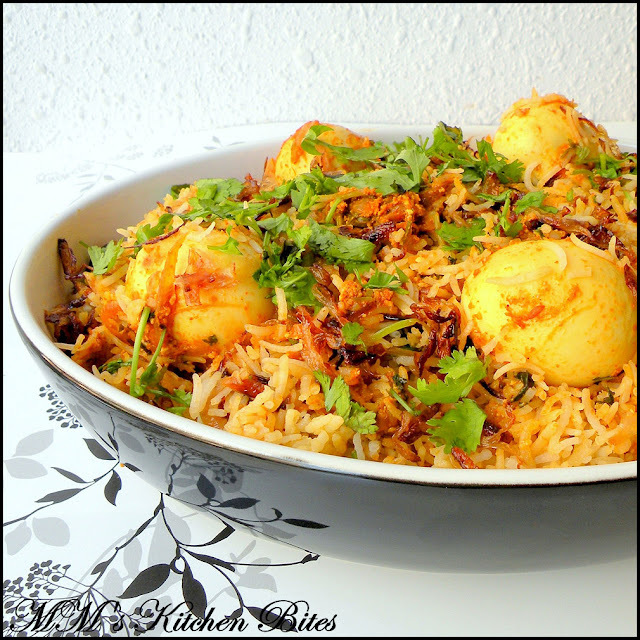 Spread half of the rice at the bottom of the pot, followed by the egg masala, a tablespoon of ghee and then top this with the rest of the rice. Sprinkle saffron infused milk, green chilies, some fried onions, some chopped coriander and mint leaves. Pour in the lemon juice and rest of the ghee on top. Cover with foil and tight fitting lid. Cook over slow indirect heat (pan placed over tawa/griddle) or in an oven for about 20-25 minutes or so. To ensure that no steam escapes while cooking – you can cover the edges of the lid with a thick kitchen towel. Remove the lid once done, fluff up the rice and remove the eggs from the middle. Mix well but lightly to mix the layers without breaking the rice. Arrange the rice on a serving platter and top it up with the eggs. Garnish with the remaining coriander leaves, mint leaves and fried onions. Serve hot with some raita, salad and/or gravy of your choice. Hey by the way have you checked out the Facebook link i send you? Made this today only difference I cooked it in a pressure cooker. I am excited for my husband to try it. He is Indian and I am American so I am trying new recipes all the time for his taste. I made this today I am so excited for my husband to try it. I cooked it in a pressure cooker and it turned out looking great. 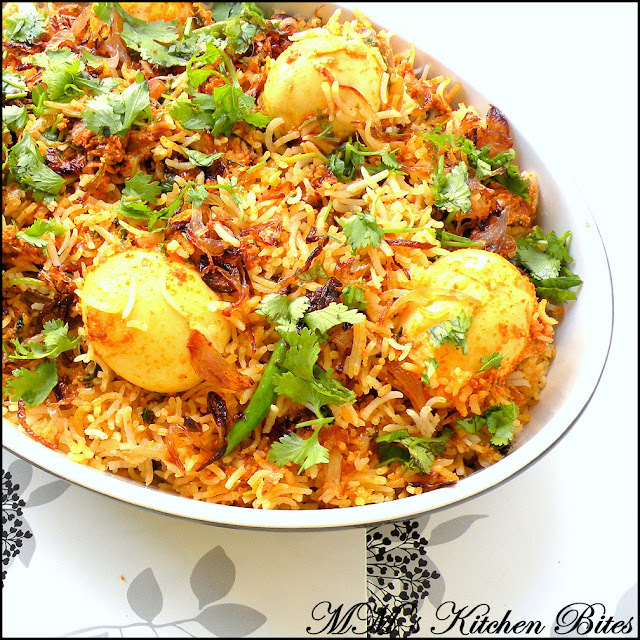 My husband is Indian and I am American so I am always looking for new recipes for his taste. I had never made biryani like this so can't wait to taste it.